Social commerce phenomenon Fab is only a year old, and it’s already raised $156 million in venture capital and launched a number of products in a variety of countries – and it’s upgrading those products at a rapid clip, too. Fab boasts 5.5 million members, all of which signed up without the help of Facebook Connect. Today, Fab is finally integrating Connect to enable people to register and start shopping for design items on the site – and on the go – more swiftly. In addition, the social shopping company’s mobile applications are getting a nice upgrade with the addition of the ‘Live Feed’ functionality and the ability to filter the feed down to recent activities across the site, and activities from friends. Currently, up to 40% of daily visits to Fab come from its mobile apps for iOS and Android, so it’s an obvious area of focus for them. Furthermore, Fab says its mobile application users convert to purchasers more than twice as often as Web-only users, and also buy twice as often. Fab 3.0 for mobile, as the upgraded product has been named, brings the Fab Live Feed to the company’s smartphone apps, enabling people to browse rich images of the most recent products that other people are buying and faving. 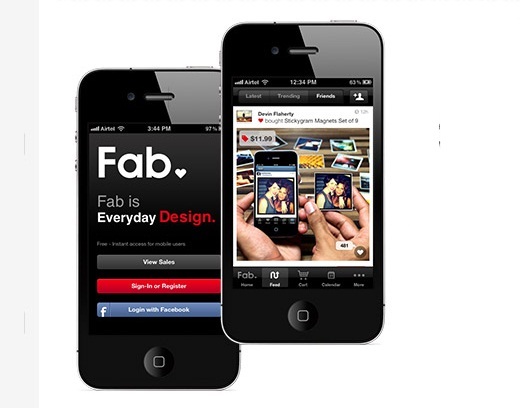 Fab says it is “kinda like Instagram for design discovery” although that comparison is kinda lost on me. I’ve already noted the Facebook Connect integration above, but here’s the weird thing about that: Fab CEO Jason Goldberg is on record as saying that Fab is the first e-commerce company that was built entirely on Facebook. After all, more than 20 percent of Fab’s daily trafﬁc comes from social services, and 50 percent of its membership has joined from social sharing. Goldberg also tells CNNMoney that Fab is currently spending “millions of dollars a month” across 20 countries on Facebook advertising. Took them long enough to add Facebook Connect to its website and mobile apps, but hey, it’s there now (in the U.S. at least, Fab’s European stores only have Facebook Connect implemented on the website for the time being). Next week, Fab says it will be launching some “major upgrades” on its website designed to help people browse and discover products better, and I gather that Fab’s European sites will finally get matched up to its U.S. counterpart in September. Last month, Fab acquired fellow design store LLUSTRE.COM, which is now Fab UK.